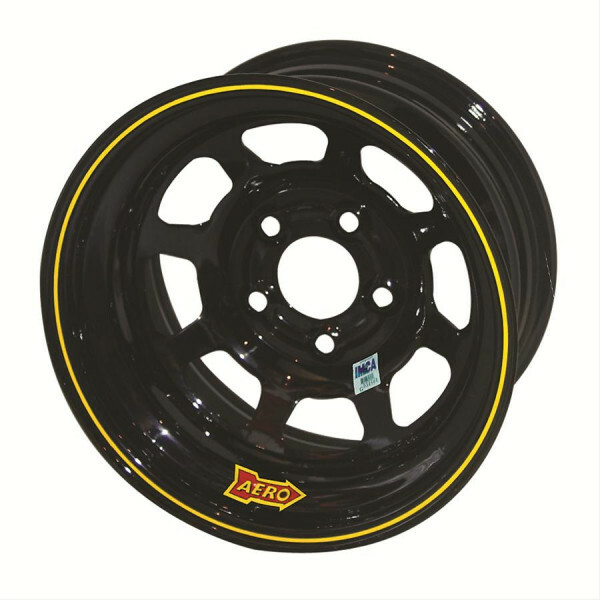 "Felge, Series 51 15 x 8 schwarz Lochkreis 5x4,5″ Backspace: 4″"
Wheel Width (in): 8.000 in. Center Bore Diameter (in): 3.090 in. Notes: Wheel is not DOT approved for street use. Aero Race Wheels 51 Series spun-formed wheels feature a deeper drop center for easier tire mounting and dismounting. They have the largest drop center in their class, providing the highest brake caliper clearance and brake-cooling capabilities available. All center discs are made from high-grade HSLA steel to provide maximum strength and durability. The Wide 5 disc has just gone through a major transformation, improving its strength drastically. The Aero Race Wheels 51 Series wheels are designed to offer you the lowest runout and highest quality wheels on the market at an affordable price. These wheels are track and machine-tested to ensure their strength. Auf Grund von in letzter Zeit häufig aufgetretenen Fehlbestellungen, bitten wir vor Bestellung von Felgen um eine schriftliche Anfrage per Email. Nicht jede Felge passt auf jedes Fahrzeug! Sollte eine Felgenbestellung ohne vorherige Nachfrage bei uns eingehen, gilt diese als nicht retourfähige Special Order! Not every wheel fits every car! Please be told, that every wheel order needs to be double checked via email. If you order a wheel without corresponding with us before placing the order, the wheel will be sold as a Special Order with no chance of returning! Felgen Lochkreis: 5 x 4 1/2 in.